Atomic spectroscopy is the determination of elemental composition by its electromagnetic or mass spectrum. The study of the electromagnetic spectrum of elements is called Optical Atomic Spectroscopy. Electrons exist in energy levels within an atom. These levels have well defined energies and electrons moving between them must absorb or emit energy equal to the difference between them. In optical spectroscopy, the energy absorbed to move an electron to a more energetic level and/or the energy emitted as the electron moves to a less energetic energy level is in the form of a photon. The wavelength of the emitted radiant energy is directly related to the electronic transition which has occurred. Since every element has a unique electronic structure, the wavelength of light emitted is a unique property of each individual element. As the orbital configuration of a large atom may be complex, there are many electronic transitions which can occur, each transition resulting in the emission of a characteristic wavelength of light, as illustrated below. How the three techniques are implemented. The science of atomic spectroscopy has yielded three techniques for analytical use: Atomic Absorption. Atomic Emission. Atomic Fluorescence. The process of excitation and decay to the ground state is involved in all three fields of atomic spectroscopy. Either the energy absorbed in the excitation process, or the energy emitted in the decay process is measured and used for analytical purposes. If light of just the right wavelength impinges on a free, ground state atom, the atom may absorb the light as it enters an excited state in a process known as atomic absorption. This process is illustrated on the right.Atomic absorption measures the amount of light at the resonant wavelength which is absorbed as it passes through a cloud of atoms. As the number of atoms in the light path increases, the amount of light absorbed increases in a predictable way. By measuring the amount of light absorbed, a quantitative determination of the amount of analyte element present can be made. The use of special light sources and careful selection of wavelength allow the specific quantitative determination of individual elements in the presence of others.The atom cloud required for atomic absorption measurements is produced by supplying enough thermal energy to the sample to dissociate the chemical compounds into free atoms. Aspirating a solution of the sample into a flame aligned in the light beam serves this purpose. Under the proper flame conditions, most of the atoms will remain in the ground state form and are capable of absorbing light at the analytical wavelength from a source lamp. The ease and speed at which precise and accurate determinations can be made with this technique have made atomic absorption one of the most popular methods for the determination of metals. In atomic emission, a sample is subjected to a high energy, thermal environment in order to produce excited state atoms, capable of emitting light. The energy source can be an electrical arc, a flame, or more recently, a plasma. The emission spectrum of an element exposed to such an energy source consists of a collection of the allowable emission wavelengths, commonly called emission lines, because of the discrete nature of the emitted wavelengths. This emission spectrum can be used as a unique characteristic for qualitative identification of the element. Atomic emission using electrical arcs has been widely used in qualitative analysis.Emission techniques can also be used to determine how much of an element is present in a sample. For a "quantitative" analysis, the intensity of light emitted at the wavelength of the element to be determined is measured. The emission intensity at this wavelength will be greater as the number of atoms of the analyte element increases. 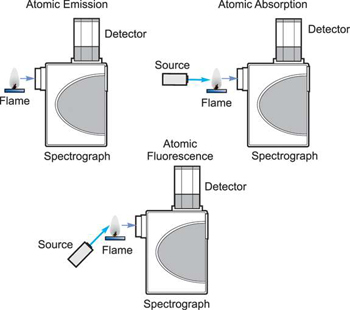 The technique of flame photometry is an application of atomic emission for quantitative analysis. The third field of atomic spectroscopy is atomic fluorescence. This technique incorporates aspects of both atomic absorption and atomic emission. Like atomic absorption, ground state atoms created in a flame are excited by focusing a beam of light into the atomic vapor. Instead of looking at the amount of light absorbed in the process, however, the emission resulting from the decay of the atoms excited by the source light is measured. The intensity of this "fluorescence" increases with increasing atom concentration, providing the basis for quantitative determination.The source lamp for atomic fluorescence is mounted at an angle to the rest of the optical system, so that the light detector sees only the fluorescence in the flame and not the light from the lamp itself. It is advantageous to maximize lamp intensity since sensitivity is directly related to the number of excited atoms which in turn is a function of the intensity of the exciting radiation. 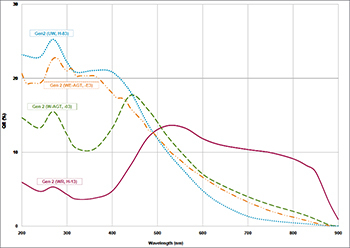 While atomic absorption is the most widely applied of the three techniques and usually offers several advantages over the other two, particular benefits may be gained with either emission or fluorescence in special analytical situations.